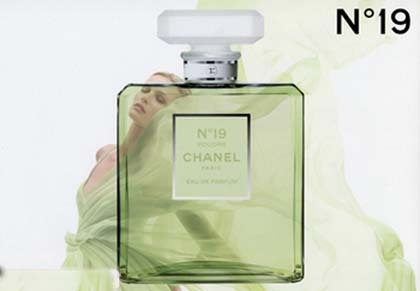 Apparently Chanel decided that the best way to mark the 128th anniversary of the birth of Coco Chanel was to come out with a flanker of Chanel No 19, which arrived in 1971, the year of her death. Interesting, but I think what they did to the original would have Madame Chanel clutching her faux pearls. Poudre takes out the main green and leather from No 19 and substitutes powder and an inoffensive skin musk. Comparing the two side-by-side, No 19 is green and rather cold in a way that is very French. Poudre loses all that and is face powder and skin musk. In fact, Poudre sort of comes across as No 19's rather dowdy older cousin from up country who's visiting Paris for the first time. She's met No 19 for lunch in a print dress which she realizes is wholly wrong here and is feeling very out of place, unstylish and elderly. Her cousin No 19 is polite and kindly asks her about her trip and her life on the farm while inwardly thinking that it was a good decision to meet at this place near her cousins hotel, in an arrondissement where she's guaranteed not to meet anyone she could possibly know. Guess which one I want to wear. $85 for 1.7 oz, exclusively at Saks and Chanel Boutiques. I tried from both. No. 19 as a POWder? Tell me it ain't so! oh nooooooo! Must was perfume part of brain in bleach now. Oh how cruel! But fair, unfortunately. Chanel will be hoping that the general customer like Poudre, because the blogging community is giving it the thumbs down. I haven't yet smelled the Poudré, but love the "original", that is the current version of No.19. I will have to sniff this at some point. Your description is hilariously funny! No.19 seems to be the Chanel with fangs. Judging from the various accounts of Poudré they have been removed. Yes, sadly 19 Poudre should never have been born. The only thing lovely about it is the bottle and the colour of the juice. I practically drowned myself in it at the frag counter and STILL had to mash my arm to my nose. When I could detect it, I got a little rose, a little iris and a little nice musk. Flash forward 6 hours, my clothes (also sprayed) are reeking of cheap blackberry chapstick and it's making my throat sore and more importantly making me terribly cranky. Why, why, why Chanel are you butchering your production to produce fragrances blatantly marketed to those who have not yet developed any sophistication. Please adhere to your former standards and allow the newbies to cut their teeth on body sprays until they are able to appreciate the artistry that you have rightfully become famous for. As an aside, what have you done to No. 5? In all three strengths it lasts all of 20 minutes on me! Thankfully, I've stockpiled two 100 ml. bottles of original 19 in EdT and have the EdP as well in case you turn that into water too!! In defense of this new 19 as skin scent it has a good effect if layered with EDT in my opinion. Oh Tom, how well you know the French! And what a beautiful script for a short film! LOL!!! I guess the cousin's husband is wearing Bleu. Best review I have read on this. Great writing, you know the French well! Did Chanel just pull a Michele Bachmann (Elvis) ? Best review yet. I adore the original 19 and have worn it almost since it was introduced. I knew Poudre wasn't for me, but your incisive review nailed for me the reasons why. The first whiff of this wasn't bad, but within 10 minutes I was craving the real thing. The situation was only remedied with a good spray of vintage No 19 to mask all of that insipid muskiness. Thanks for the spot on review. I don't think it will be a seller for them. It's not very good. It made me cranky too. I guess I prefer my perfumes mean and my people kind! My issue is that I wore them side-by-side. It was like choosing between Dennis and Randy Quaid.